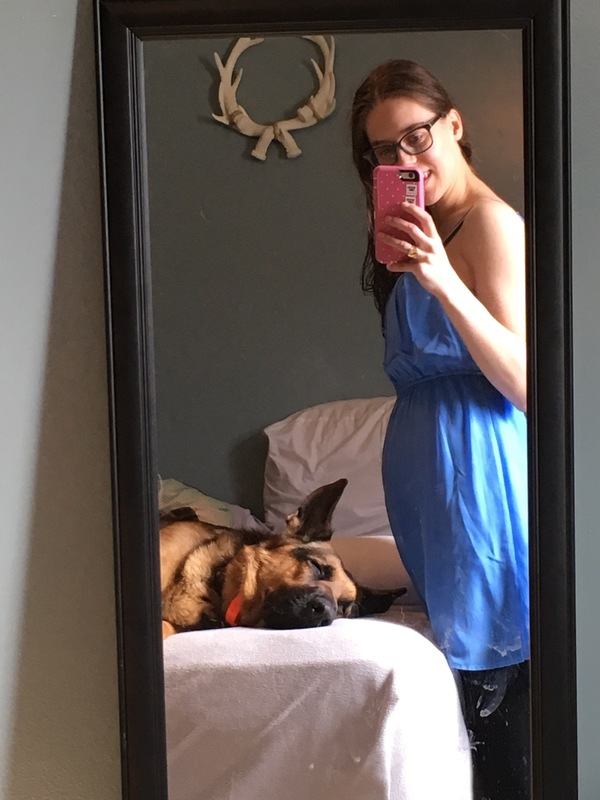 People on my Instagram and Facebook have been having so much fun with my Bump pictures that feature my German Shepherd Bomber in them, I’ve decided to post another collection of some of the pictures I’ve taken since my last post. My belly seems to be expanding DAILY and I’ve now got a perma-bump, whereas before my belly was fluctuating in size throughout each day. I’m a few weeks out from my third trimester (where does the time go?) and baby has been dancing up a storm in my belly! 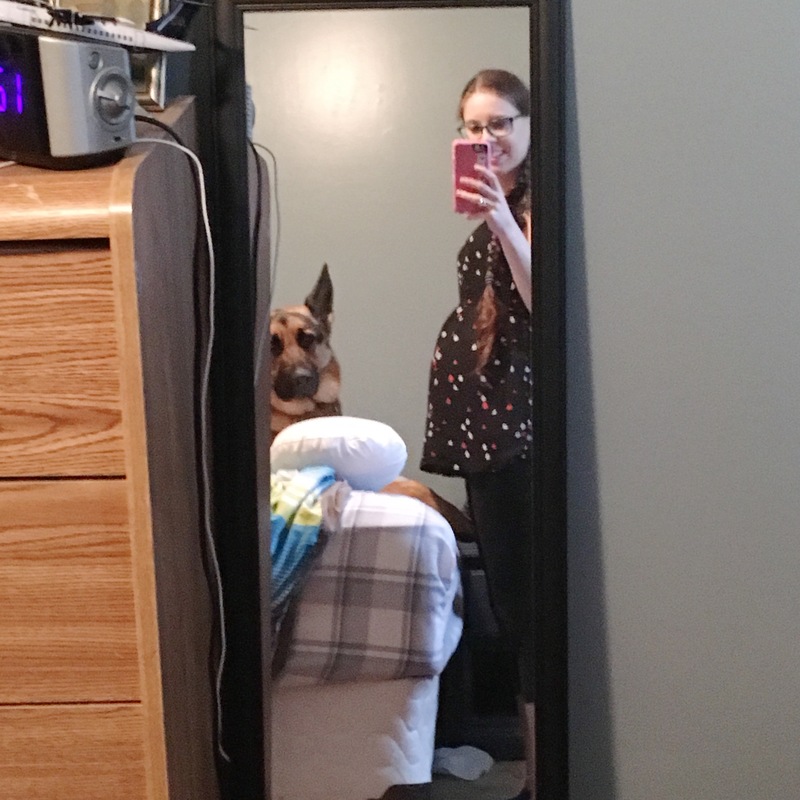 Bomber has been even more attentive to movement of the baby and inspects me more often than in my first trimester! Bomber and I still fight over my pregnancy pillow, he takes full advantage of my middle of the night bathroom breaks, I come back to the room to him cuddled up fast asleep in the pillow, every. single. night. This picture below was actually one of the cutest moments, I FINALLY was able to get Jared to feel the baby moving, because, of course, the baby wouldn’t be moving whenever other people were around. I got him to come and sit beside me, and with his hand on my belly felt a kick and jumped! 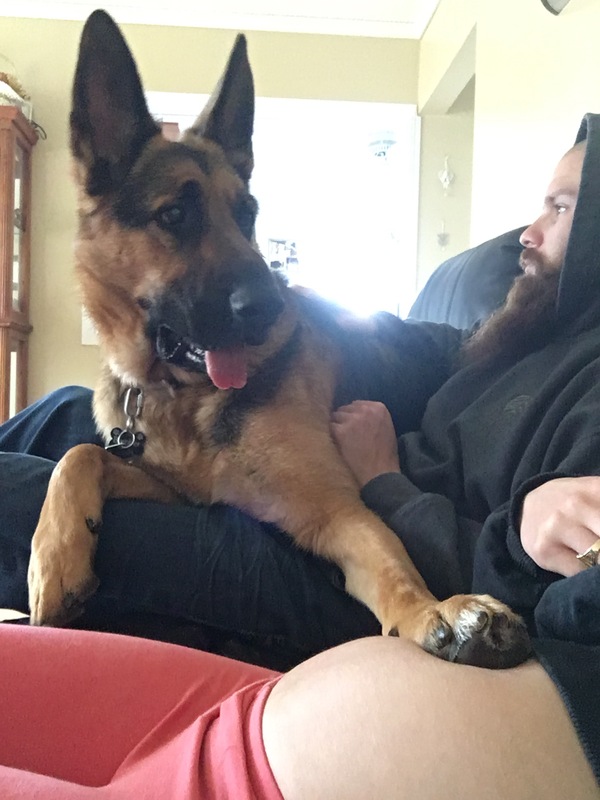 Bomber then hopped up on the couch and onto Jared’s lap and put his paw on my belly to see what the fuss was about. I cannot wait for him to become a big brother, he is absolutely going to LOVE this baby! I will admit, I think Bomber is starting to get fed up with being asked to pose for so many pictures, but being the good boy that he is he reluctantly sits in his spot and waits for me to take my pictures! Other times he is super into them and cracks a big goofy smile at Bump! All I have to say is, this baby sure is lucky to have a big brother like Bomber, I can’t wait to see them interact and grow up together! There is definitely going to be a special bond between Bomber and Bump! I can’t wait until that point, but for now, while we wait, Bomber is doing his best protecting Mum and Bump! Always keeping a watchful eye and learning how to navigate his protective instincts! Previous Post Pregnant Diaries: What is a Fetal Assessment?